blogging world of crafty gals and guys! 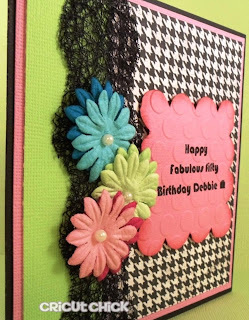 blog button for Debbie's Birthday card! The Glamorous Side of Scrapping. re-creating it with paper. Thank you Ashley! I think it's pretty close! blog in the hop for each day of the hop! I'll use random.org to pick one of you to win! Debbie is first on the list below. I love that you re created the button. You did a fantastic job! Julie, I love how you personalized the sentiment and even embossed it. Wow ... You did an amazing job recreating the blog button!! What a great job on re-creating. what a clever idea! the card is terrific! WOW!! Awesome job recreating the button! What a wonderful idea:-) I am already a follower..
What an awesome job you did on the card, she is gonna love it, mums the word. great replica. Wow Julie!!! What a job recreating the button!!! It is crazy close! I am your new crafty follower and I am excited to see what else you make!!! I would love if you came to visit me too, this is fairly new to me and I am looking to gain followers! Hope to see you there. It is nice to see such close friendships in the craft world even though you may be miles apart. What an AWESOME job! Love it! how awesome is that!! You did a perfect job recreating. New follower and fellow stop on the hop. Gorgeous card!! I am sure she will love it!! TFS! I LOVE your card! You did an awesome job recreating the button! What a clever idea. You did a great job re-creating the button. Thanks for sharing. What a beautiful card. I love the flowers and your use of colors! Stunning. I am a new follower. you have beautiful work! I love how you recreated her blog hop button in a card for her so she can have it forever. Thanks so much for sharing. Oh my... You are so talented to recreate such an amazing design. The colors and lo are perfect! Great colors and a terrific card. It is certainly different and I love it. LOVE the houndstooth! ;) And I am now a new blog follower! Thanks for showing off your talent! Great work on the recreation. You did the right thing! Lovely card. I love the colors and design of your card. Nice being in the hop with you. checked back for day 2 will check again tomorrow! An amazing Job! Beautiful card! Wow, that is an exzct replica. Great job.Thanks. That is awesome!!! You did such a great job re creating this card for her! Fabulous job on your card. Love the little touch of green. It came out very pretty. Pretty card!! Happy Birthday Ms. Debbie!!! I love how you recreated the button in a bday card! I'm already a follower. You did an AMAZING job creating this card! It's a great recreation of the blog button. I love the black lace. TFS and for the inspiration. Scrappy hugs! WHAT AN AWESOME CARD....MATCHES PERFECTLY...AWESOME JOB!!! Wow, love your color choices! And the doubling of the flowers in dark and lighter is perfect! Thanks so much! You did a fantastic job recreating the blog hop design. I love that idea!